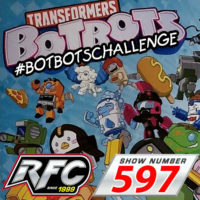 Radio Free Cybertron 597 – Challenge of the BOTBOTS! This week on RFC: For Thanksgiving, we’re focusing on things we love! You’ll get an earful of BOTBOTS, as well as IDW’s Gobots #1 and Star Trek vs Transformers #2! Fear not, as there are no spoilers, just love. Also on the show, Diecast decks out his car with unlicensed Taobao Transformers decals, plus we all love Hoist Goes Hollywood and you should too! All that and more on this week’s Radio Free Cybertron! This week on Radio Free Cybertron we are all about Botbots. We have them in-hand, and we can’t wait to tell you the good news. Also on the show Diecast shares his hands-on time with Transformers Siege way back at NYCC 1973. 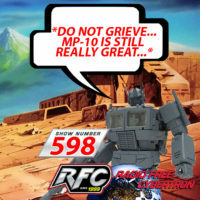 All that and Botbots on this week’s episode of Radio Free Cybertron! This week on Radio Free Cybertron, Chris has Siege Megatron in-hand and shares his thoughts! Also on the show, huge news! BOTBOTS are on the way and as of this posting, some are available on Amazon. Grab yours! We talk about this sweet Optimus Prime G-SHOCK Watch Optimus Prime from Japan that Brian can’t help but want. We chat a bit about Generations JD Red Knight, and how glorious it is, plus a little bit about Geoffrey’s Toy Box, FansToys NOT Arcee, and tons more! This week Matt, Diecast and special guest Eric Crownover are back from a fun-filled trip to TFCon USA in Chicago. They give their first-hand account of all the items that were on display as well as the all the new stuff they brought home with them. That wasn’t the only convention in the past week, however, so there are plenty of new Studio Series and Siege reveals to talk about as well. Oh, and it looks like early tracking has the Bumblebee movie tanking upon its release in December. Oh well, at least we’re getting some pretty cool looking shoes around the same time. 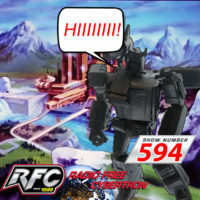 So tunnel your way out from under your TFCon haul and join us for this week on RFC!